The IS-OGP provides a simple, complete solution that adds a laser light source to your microscope for optogenetics research. It positions a small (10um typical with 20X objective) stimulation spot to any location within the field of view. 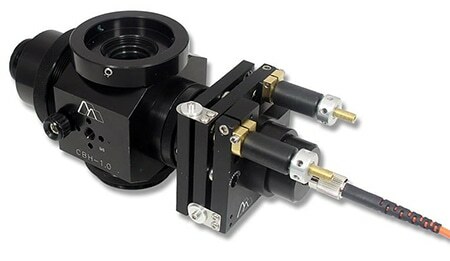 The single-mode FC connectorized fiber optic cable input from your light source, combined with the included FLG-FC/2 optics internal to the IS-OGP (patent pending), creates a collimated input to the rear aperture of the microscope objective.